I was invited to a lakeside home where the owners wanted a three-panel design that was colorful and had a Mexican flair to it. The three panels ended up being 15 feet across. I looked around the area of the house where the windows were and saw a few pictures of parrots. 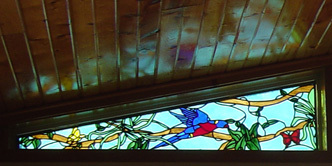 We agreed that a parrot would be the centerpiece of this three-panel transom. Fifteen feet was a lot of area to cover and I did not know where to start. My husband made templates of the windows so I could use exact measurements, which is so easy to do with Glass Eye 2000. I began by putting a parrot (inspired by a Glass Eye parrot pattern) in the middle of the center panel and the design evolved from there. Obviously parrots are found in trees so I drew the branches. I placed some leaves on the branches but still wanted a little something else. The ferns at the top of the panel gave it a nice look and I could use the wrapping of the vines to provide interest, and also make the individual pieces cuttable. Now for the two side panels. I decided that the branches would continue onto both side panels. The colors of the parrot were continued with the smaller birds on each panel. There was still too much space that needed a little something so I began placing different sized butterflies throughout the three panels to complete the design. With all the colors and textures available at the J. Ring Glass Studio in Minneapolis, and all the colors in the pattern, selecting the glass took over three hours. I do not know how I would have kept everything straight without the Notepad feature of Glass Eye 2000. I did not, however, give myself enough of a scrap factor and ran out of the sky color. When I went back I realized that every piece has its own characteristics and I needed to buy extra so I could cut the centers out of some of the glass panes to get the look I needed. Some of the pieces on the pattern were small, so I did some tweaking of the pattern as I was cutting. The center panel is 68.5" x 25.8" and both side panels are 56" x 14.2". The finished panels matched the templates so when it was time to install the windows everything fit like a glove. The owners are thrilled with the new look and tell me that people on the lake come to the house to see the windows up close. 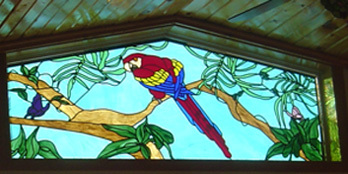 Toni Grundstrom has been doing stained glass for over 15 years. She attended a few classes at J. Ring Glass Studio and took it from there. She uses Glass Eye 2000 to design everything she does including panels, stepping stones, lantern panels, garden art, stepping stones and night lights. Toni can be reached by email.